There are two types of intro: The straight and the dropped. This deals with the former. Some years ago the Daily Telegraph would boast about the length of its intros - 80-90-100 words plus were, if an exception, not uncommon. Particularly, if memory serves, in its cricket coverage. The writing was, of course, beautifully crafted by professionals at the top of their game... They could get away with it, you cannot. Like many of the "rules" on the blog this is not hard and fast but a guideline - the problem is not that you occasionally break it but that you break it often. So if your intros are regularly hitting 30-40 words you are doing something wrong. This really isn't a matter for debate. You are writing for a newspaper not a specialist manual. Being direct does not mean dumbing down. Nor does it mean - heaven for fend - tabloid. It means being to the point. If it makes you feel any better remember you are part of the Twitter generation (well most of you). It means that your average reader will be used to 140 character long sentences - including the spaces. That's around 22-24 word mark (I know, I've checked my own Twitter personal account - Anthony_Bonnici if you're interested - and several others, from both tabloid and broadsheet writers - to see how they compare). So now 25 doesn't seem so bad, does it? SEATTLE (AP) — Raffaele Sollecito, whose budding love affair with American exchange student Amanda Knox helped land him in an Italian prison for four years, maintains the couple's innocence in a new book but acknowledges that their sometimes bizarre behavior after her roommate's killing gave police reason for suspicion. The problem here is the reporter has not made up his mind what the important facts. And so rather than leaving something out he has put it all in — and that's why the sentence is 46 words long. Why does it matter? Getting into the habit of tighter sentences is a useful lesson to learn, for a start. Now most "broadsheets" no longer are — they've taken the compact form. Editorial space, especially with ever squeezed budgets, is at a premium. People's attention spans are certainly not what they were. Think I'm talking about dumbing down... try a copy of The Times, say, 100 years ago... 50 years ago... Hell! Even 20 years ago. No mention of the latest deaths and not a hashtag in sightAs you can see, quite painful. Some might even say it's the future. Let's put aside the general style and look at the second par. The coroner for South-West Lancashire opened the inquest on the bodies of those who were killed, but, after taking formal evidence of identification in the case of nine, he adjourned the inquiry until next week. A total of 35 words. Who else was he going to open the inquest for? 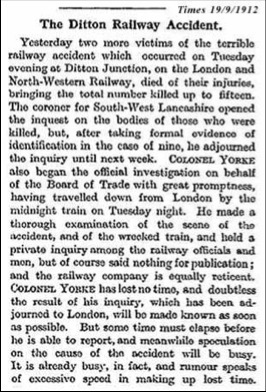 And for all this we don't know the name of the South-West Lancashire coroner or, indeed, any details of the actual victims of this terrible railway accident. Someone was clearly being paid by the word (actually they probably were). 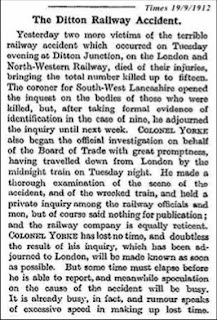 Two more people found in the wreckage of the Ditton Junction railway disaster died of their injuries yesterday taking the death toll to 15. I'm sure people could do better. The point is lengthy sentences do not necessarily mean serious journalism. It can mean lazy flabby writing. Ignore all these points if you are being paid by the word. This was the first lesson our news lecturer taught us at Uni! Although he was less generous giving us just 17 words! It's definitely a good habit to get into, there is so much waffle about!